Ahhhh. Who does not love summer getaways? Even if you cannot go far away or take the whole week off, a weekend getaway can refresh your soul. And that, it did. We “pricelined” our Saturday night stay, bidding low and having our bid accepted and headed out Saturday morning on our little getaway. I love how relaxed we felt from the beginning. No rush, no stress – just driving along with no real plan. 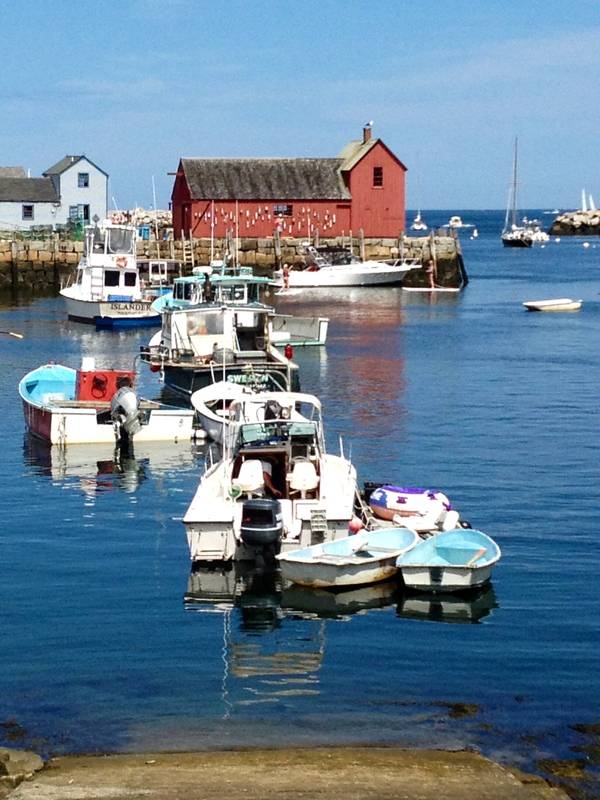 If you have not visited the coastal towns of Massachusetts before, it is something you must do. We often vacation on Cape Cod (I was thinking of my buddy Joe @ http://joedegiorgio.com/ who got to go for two weeks this year) and love its beaches and sand dunes. We headed to the North Shore which is just as lovely. My husband’s favorite beach is, Plum Island (named for the wild Beach Plum Shrubs that grow on the dunes) off of Newburyport. 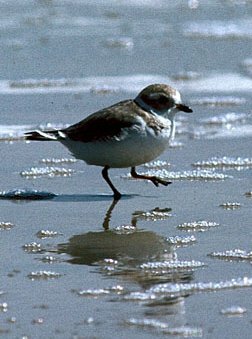 He is an avid birder and loves the fact that some of the beach is sectioned off to protect the many nesting and endangered, Piping Plovers. It is such a beautiful and pristine beach. We took a little walk and ran into the incredible and only resort on the beach called, Blue The Inn On The Beach. Even though we had our non refundable Priceline reservation already, we checked out the rates for next time. At $400/night we decided to turn back around and go sit in our great Rio Beach chairs which by the way, have built-in cup holders – so there! While relaxing on the beach, my mind kept veering off into blogosphere. Everything around me made me think of a post I had read, a particular blogger or a blog-worthy picture I could be taking. Is this what happens when you have been blogging for a while? Your life is forever linked to your blog? I kept telling myself to STOP. Focus on your hubby and this beautiful day, brickhouse! Forget about the blog! But, I looked at the cutest couple with their adorable little girls playing in the sand and I immediately thought of Andy ( aka father of the year) from http://ourlifein3d.com/ and his great vacation pics with his girls. got for her weekend getaway. Shannon’s was a pumped up tube with mini fridge and all! I kept coming back to my hubby and smiling at him. At least he thought I was thinking about him! We were soon hungry (when am I not soon hungry) and left the beach for an early dinner at the local Grille. I looked at the menu and the only thing on my mind was, what would mama (my awesome friend the nutritionist) want me to order that is gluten-free? Ay! This place is famous for its fried clams but I knew this was not an option. I was ok. 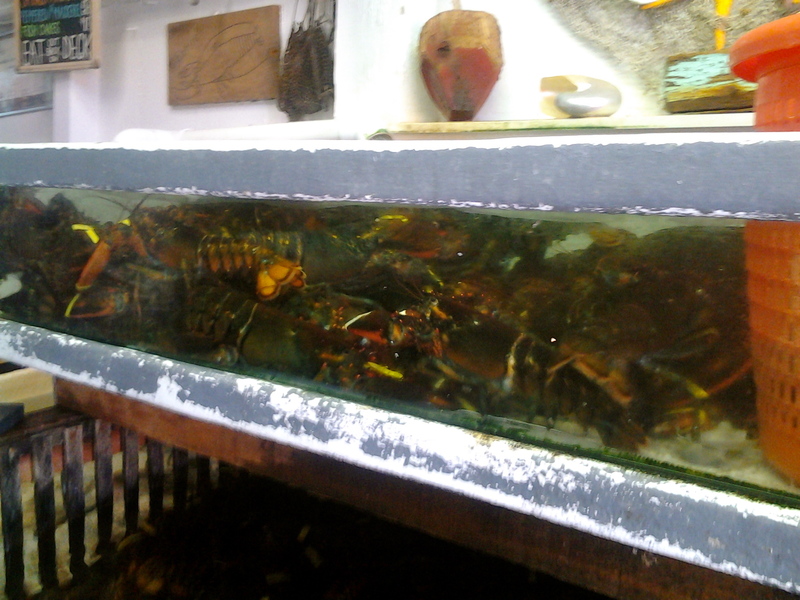 I ordered a lobster salad with avocado and cucumber along with mussels. Pretty good, huh? Except that the lobster salad was minuscule and did not even make a dent at my starvation and the mussels although in abundance…did not fill me up either. PLUS, I could not dip the wonderful fresh smelling bread into the mussel sauce! AY! I filled up on the liquid variety on the menu and stayed strong. Our overnight accommodations were…so so. We had tried to get reservations at other more suitable places but everything was booked since our trip was last-minute. The most interesting part about our hotel was that it was a stone’s throw from the infamous,http://www.thegoldenbanana.com/ a gentlemen’s club sort of place on Route 1. Nothing good ever comes out of staying in a sprawl infested Route 1. You know the kind. But, as tempting and tantalizing as it was…we stayed away. 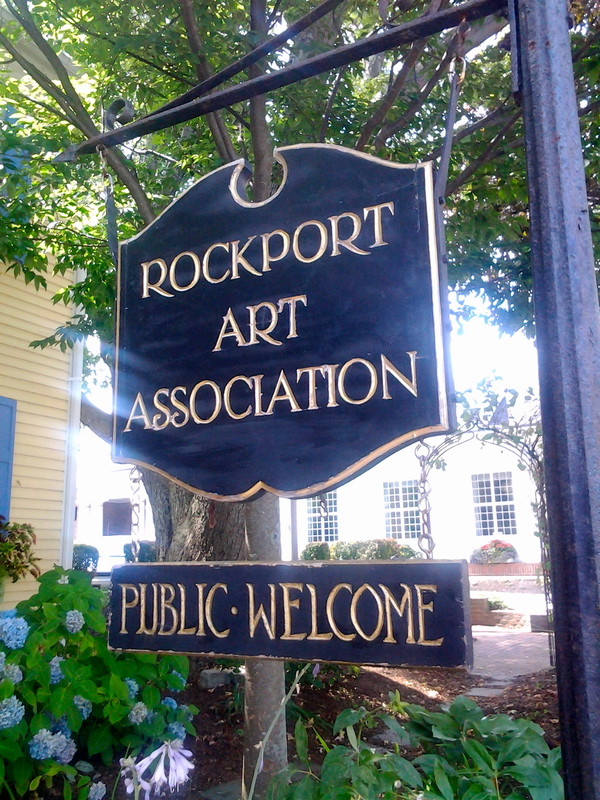 The next morning we headed to beautiful Rockport (and I thought about my friend’s husband who grew up there), a historic little village off of Cape Ann. Such an eclectic and gorgeous place. An artist’s paradise. Motif No 1 A fishing shack that is “the most often painted building in America”. As we walked around, we saw many signs. Everywhere I turned, my blogging friends were there. I enjoyed the gluten-free treats (and thought of my friend who is also just starting the g/f craziness with me) and did more walking than I probably should have. Oh yea! Take that – gluten world! It truly was a wonderful weekend. And although y’all were not always on my mind during this getaway (wink,wink), I am glad you came along. Reminded me of a vacation on the Cape when I was twelve. My aunt and uncle convinced my father to take us to Hyannis as a way to ease us over my mother’s death. I want to go back to pull up the memories and write about them. They’re still there. I need to work it out the only way I can, on paper. She’s in a place inside my head that I’ve locked up. The thing is some kind of bad things happened and now all of the people responsible are dead except for a few of their kids. What a great trip!!! 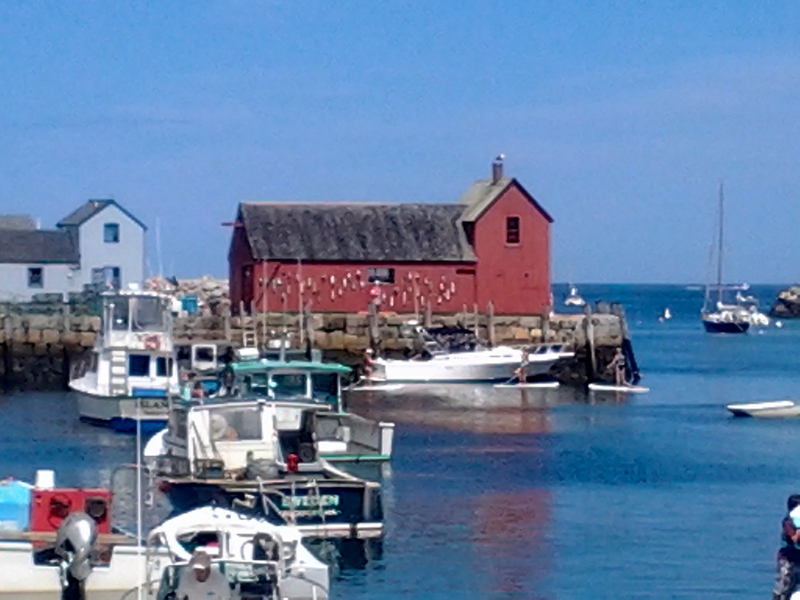 I’ve been to Massachusetts, but not to the coastal towns. I’d love to go someday. Great pictures by the way! Glad you had a fab time. Thanks, L. Marie! We so needed it and it was heavenly. Anytime one is near the ocean is so magical and healing. Those pictures are fab. Your dinner must have been yummy. Yes, Shelley! I had to control myself from eating everything in sight. I had a great time on our vacation, but got a little sunburned on the top of our shoulders. Next time use the SPF 75, hmmm? Sounds like you had a great time! And how nice of you to think of blogger buddies! Thanks! I love weekend getaways! I can’t believe you ditched us for the ice cream! Glad you two got a much needed break. I prattle on about bloggers and blog posts when I’m out with my girl too. How did you guess that I ditched you for ice cream?? I can’t think of any other time that I would have needed to ditch you! 🙂 Blogger friends are like family so you are right, we take them with us everywhere we go! I am so glad you had some proper R&R with your sweet husband! It makes my heart happy that you thought of me, too. 🙂 And yes, I spend a lot of time thinking, “That would make a good blog post” I think we will always think this way now and that’s totally okay. I look forward to your next blog post. Mwah!! Thanks again! We don’t get to go out near the ocean as much as we would like. We are inland but it’s only 2 hours away which is not too bad. 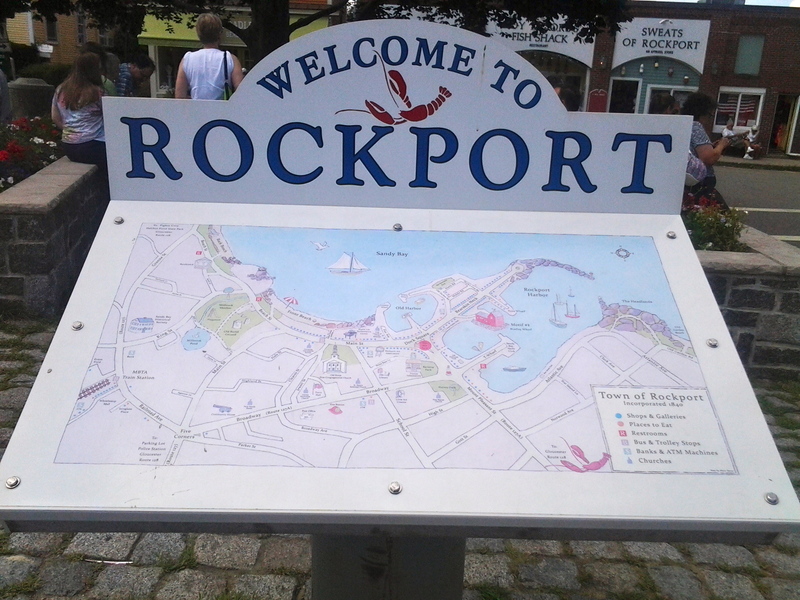 I would love it if my husband got a job in any of the towns by the shore. 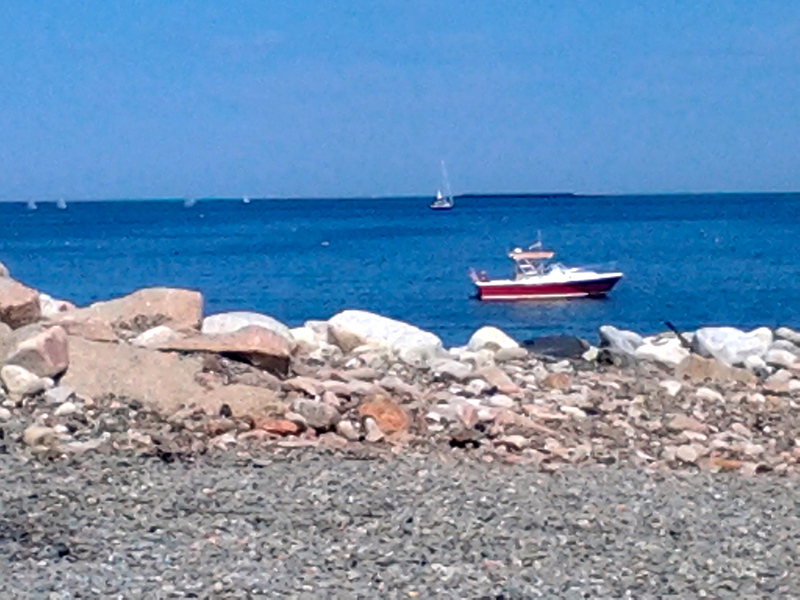 You are lucky to have the ocean so close to you and the boat. That’s what I call living! I am so with you on this! Yes, I see a scene on vacay and think how my readers would enjoy hearing about this or maybe one or two readers in particular. I think you have been officially converted to wonderful blogress by now then. its like an addiction, sometimes isn’t it? Thanks for sharing your trip and the wonderful pics. Now I want to make it up to your beach too! Give me a Rio chair with a cup holder and I am in heaven! Last minute trips are the best! Wow, Blue The Inn On The Beach looks spectacular, but at $400 per night, I think you made the right call. Like you, I have a hard time keeping my blog out of my head. I feel as though I think more about the blog than my WIP…that’s not good. I’m glad you had a good time, Maria. You deserve it! Thanks for sharing your trip with us. So jealous of your get away! It’s it weird how our blogs follow us. I love that lightbulb moment when you think, ‘this would make a great blog!’ And then you start writing it in your head! You look like you combined the best of everything and had some balance. And, it is hard to read about this yummy food at 11pm without foraging. You get used to always looking out for blogging material. MTM is even guilty of pointing out things to me, giving me ideas, now. Thank you for thinking of me. I missed so many people last week and am glad to be back. Thanks Andra! My husband slowed down while driving so I could get some of those shots. I love it how they help us with our blogs. My hubby had just “survived” a tough round of controversial public meetings and decisions and I needed to get him out of town! Beautiful photos, I’m so glad you enjoyed your time away! We sure did! It’s so nice to get out of town. Thanks Catherine! It really was. 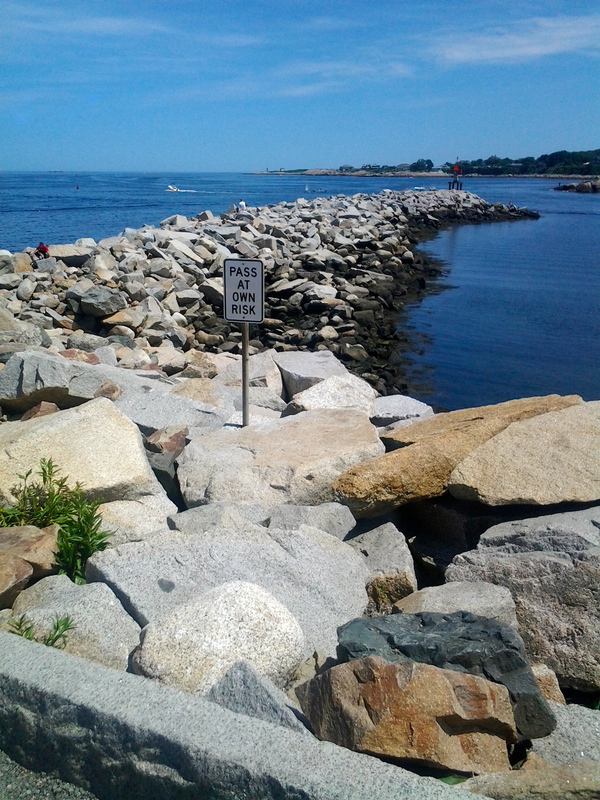 Next time you are put that way you have to go to Halibut Point! 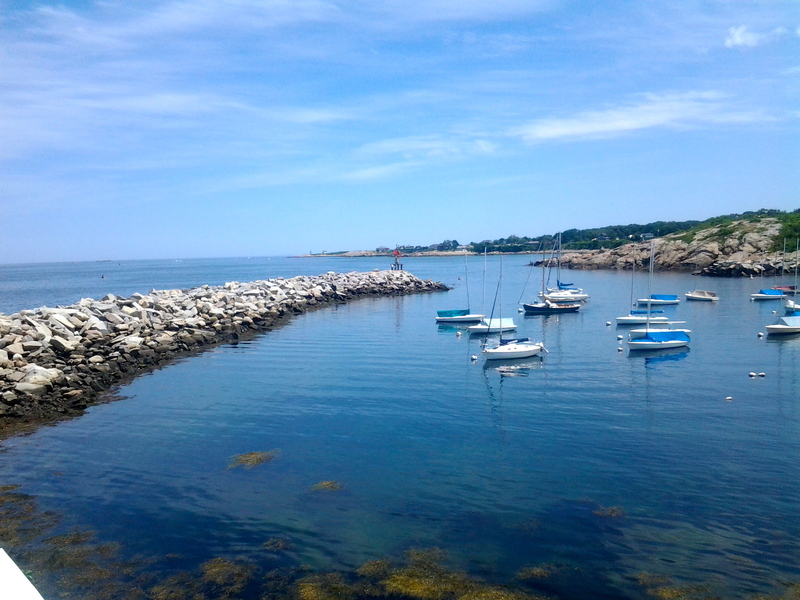 It’s a gorgeous park/hike that brings you right out over the rocks to the ocean and then have dinner at the Lobster Pool! Will do, Gina! Will you be our tour guide? I’m so jealous — I love the north shore in the summer. 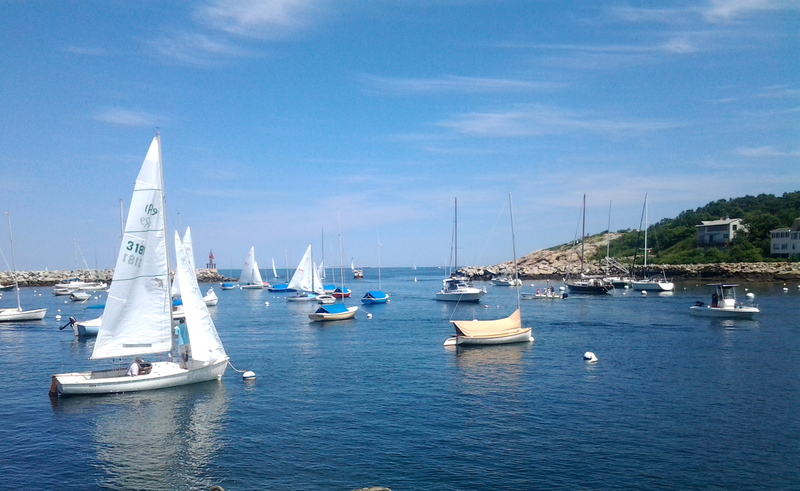 If you keep posting pictures like this, I might just forget all about what January was like in Boston and move back! I’m in tropical South Florida — after three straight years of having to dig my car out of feet (MULTIPLE) of snow and fearing frostbite on my walk to the T, I broke down and fled as far away as I could. What a wonderful getaway. Sometimes those last minute ones are the best. And chairs with beverage holders are priceless!